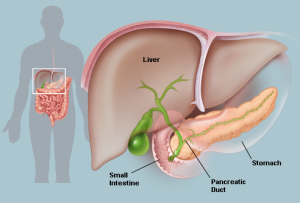 Pancreatic cancer is a malignancy (cancer) affecting the organ known as the pancreas. The pancreas is essential for healthy digestive functioning and for regulating our body’s blood sugar levels. When the pancreas is acting normally, it creates and secrets special enzymes that help metabolize carbohydrates and other foods. The pancreas also releases insulin which is a hormone responsible for reducing our blood sugar levels. If a person has pancreatic cancer, the very organ that helps keep them healthy becomes lethal. This is because with pancreatic cancer, the pancreas becomes ridden with tumors. What are tumors? They are abnormal cells that develop from cells that were originally normal. 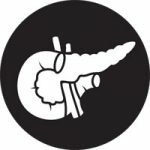 If they are not killed off by pancreatic cancer treatments, they will multiply, wreaking havoc first to the pancreas itself then spreading to other parts of the body. There are several types of pancreatic cancer that a person can become inflicted with. The most common pancreatic cancer is known as adenocarcinomas. With adenocarcinomas pancreatic cancer, a person develops tumors in the duct or enzyme-producing cells of the pancreas. Around 95 percent of all pancreatic cancer cases are adenocarcinomas. The other 5 percent of pancreatic cancer cases occur when tumors originate in islet cells or the ampulla of Vater. As far as the islet cells, these are a series of cells that produce hormones, glucagons and insulin. Meanwhile, the ampulla of Vater is an area where bile is held before it gets emptied out into the small intestines. When it does develop a series of pancreatic cancer tumors, symptoms usually appear earlier, increasing the chance that one could get treated. With the other forms of pancreatic cancer, (especially adenocarcinomas), symptoms do not occur until the disease has become deadly. In comparison to other cancers that are out there, pancreatic cancer is the most life-threatening. The survival rate of pancreatic cancer is very poor, mainly because of how the tumors spread. Granted, if the pancreatic cancer tumors can stay isolated to just the pancreas, a person’s chances of survival are drastically increased. A doctor can simply remove the tumors and/or the pancreas in hopes of treating the disease. However, the situations in which the pancreatic cancer tumors stay isolated to the pancreas are quite rare. What usually happens is that the tumors spread into the lymph nodes or even the blood vessels, making surgical intervention impossible. From there is the slim chance a person can beat the illness through chemotherapy or radiation therapy. However, the keyword is slim. When pancreatic cancer has spread into other parts of the body, it is not likely that these procedures will work. Additionally, they possess their own complications that can make the pancreatic cancer victim suffer even more. All in all pancreatic cancer is a very serious disease that is very hard to fight. Yet, if a person suspects they have pancreatic cancer, they should still go to the doctor. While it is a horrible condition to have, at least with a doctor, there is some chance of survival through medical intervention. The success rates are not as high as it is with other cancer, but what should matter to the pancreatic cancer sufferer are the numbers of people that were able to survive.